This is a review of Nioxin’s Hair System Kit, specifically System 1. Nioxin claims that this product can reinvigorate your scalp and hair follicles. They also claim that this product can dramatically increase the volume of your hair. Continue reading this article to find out if this is the right product for your needs. After an extensive search, no information on either the active ingredients or the levels of those ingredients could be found on Nioxin’s site, save for 3 instructional videos that casually mentioned some of the included compounds. After reviewing the recommended dosage provided by Nioxin, it is suggested that individuals use the 3 included products in the following order: First, apply the Nioxin Cleanser to your hair, and rinse out. Second, apply the Nioxin Scalp Treatment, let sit for 4 to 5 minutes, then rinse again. Lastly, apply the Nioxin Scalp Therapy, which is to be left in your hair for the remainder of the day. This regimen should be followed daily. Nioxin does not recommend this product for individuals under the age of 18. After looking into the information provided by Nuvo about their Hair System, we could not verify whether or not the products contain sufficient levels of the active compounds needed to see real results, as no information of that nature was provided on their site. Nioxin has no listed or known side-effects on their web site. They do, however, recommend consulting with a physician if you notice any redness or irritation on your scalp. This product is not to be ingested. Any contact with your eyes should be rinsed out immediately, followed by consultation from a doctor. One package of Nioxin’s Hair System kit costs between $34.99 and $44.99, depending on where you buy it. Shipping costs add anywhere between $8.00 and $13.00, again depending where you purchase the product. The kit contains a one month supply of all 3 of the included products. Many reviews could be found on the company’s web site, all of which were quite positive in regards to the Hair System’s effectiveness. Nioxin does not sell this product directly, so no guarantee is offered, nor are there any additional savings to be found. Individuals will need to consult the return policies of their specific retailer. No subscription program could be found that would offset costs. Nioxin’s Hair System kit seems to be a decent product, with a novel approach to hair rejuvenation. Unlike several of the products on the market today, Nioxin doesn’t require that you take an oral supplement, reducing the possible impacts on an individual’s well-being. There are also several companies and salons that stand behind Nioxin’s product as being truly effective. Unfortunately, no guarantee is offered from Nioxin, which is somewhat disconcerting, as they truly seem to stand behind their product line. The biggest negative for this product is Nioxin’s refusal to list the ingredients of their Hair System kit, something highly concerning when you consider that this product is to be applied directly to your skin. 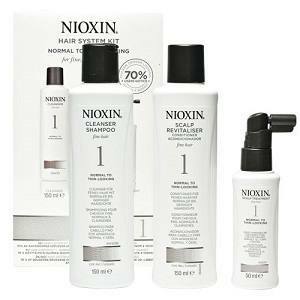 John Brownstone	reviewed Nioxin Hair System Kit	on July 1st	 and gave it a rating of 2.5.